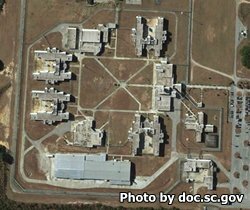 Ridgeland Correctional Institution is a level 2 medium security prison that houses adult males. Inmates here are housed in double bunked cells. The current maximum capacity of Ridgeland Correctional Institution is 1,163 offenders. This facility engages in the correctional industries program and employs inmates in the production of PVC furniture. This facility also provides video conferencing capabilities for parole hearings. Offenders at Ridgeland Correctional Institution who do not currently possess a diploma are encouraged to take GED preparation courses and obtain their GED. Additionally, adult basic education and literacy courses are offered. Medical, dental, and mental services are provided on site. Inmates can participate in vocational training and learn small appliance repair and carpentry skills. Offenders can also join twelve step programs like Alcoholics and Narcotics Anonymous and religious worship services at this prison. Selected inmates can opt to work on crews that clean litter from roadways, provide a labor force for the Department of Parks and Recreation, and can lecture at risk youths and adults in the "Operations Behind Bars" program that conveys the consequences of crime and what life in prison is like. Visitation at Ridgeland Correctional Institution is based on the first letter of the inmate's last name. Inmates A-K and inmates L-Z will rotate the time slot which they have visitation. Because of the rotating schedule you will need to contact the facility to get the current rotation. Visits occur on a rotating schedule on Saturdays and Sundays from 8am-12pm and from 1pm-5pm and on Fridays from 3pm-6pm.